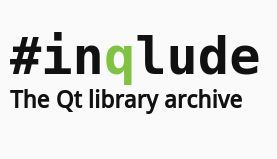 Inqlude is a tool to handle Qt based libraries. It provides developers an easy way to find, install, and use libraries, in particular third party libraries. 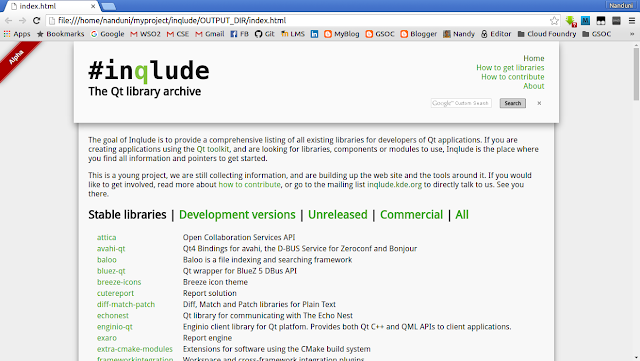 A public version of the library runs at http://inqlude.org. The website is written in static HTML and so there also is an option to generate an HTML overview of all available libraries. This can be hosted or used locally. In this blog post, I am going to explain how it can be done. At first, I thought that we require a Sinatra server or a Tomcat server to host this locally. After getting it clarified from the mentor, I was able to generate the pages and browse it from the file system. This guide would definitely help you try that. Create a specific directory at a preferred place in your file system. I have named the directory as 'myproject'. Clone the Inqlude github repository into it. remote: Counting objects: 1684, done. Receiving objects: 100% (1684/1684), 292.55 KiB | 210.00 KiB/s, done. Resolving deltas: 100% (1085/1085), done. 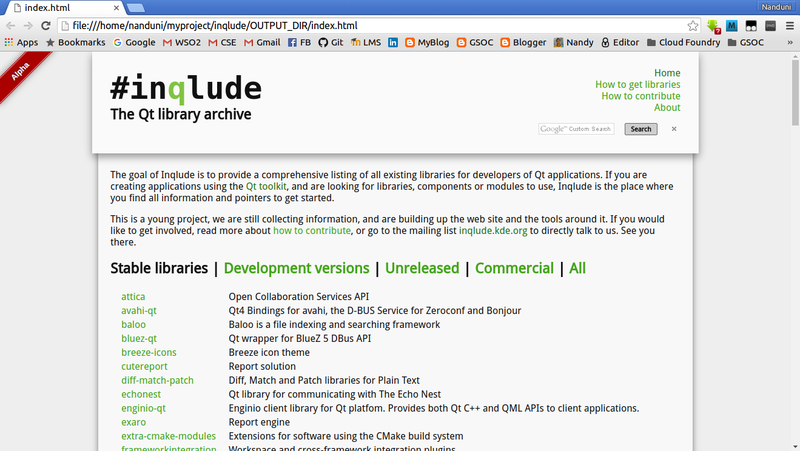 Navigate into the 'myproject' directory where you will see a new directory called 'inqlude'. This contains the repository that is cloned. Now you can install the inqlude gem executable. Now you can play with inqlude commands. You can get help about the available inqlude commands using the following command. You can find all the available inqlude commands there. Let's try one of them. If you want to know how you use install command with inqlude, use the following command. [--dry-run], [--no-dry-run]    # Only show what would happen, don't install anything. You have one last thing to do to view the website locally. Use the following command and it will generate the output views of pages in a new directory called OUTPUT_DIR which will be created inside inqlude directory. Otherwise, you can specify the OUTPUT_DIR instead of using that name. You will notice that a new directory called OUTPUT_DIR has been created. This contains the html views of all pages in view directory. For each html.haml page in view directory, a new html page has been created inside OUTPUT_DIR. Now you are able to view these pages through browser. You can modify the code and look for those corresponding changes locally as well. Hope this guide would be useful for newbies to Inqlude.